Growing up, I didn't really like perfume. If I was drawn to scents at all, I preferred ones that smelled like they would taste good, you know... like "warm vanilla sugar" (which is by Bath & Body Works). Definitely not floral or perfumy! I suppose in a desire to want to be sophisticated or grown up, I changed my mind. I bought my first and only bottle on my birthday last year during my visit to Philadelphia. It probably doesn't surprise you that I wanted whatever the ultimate classic was. 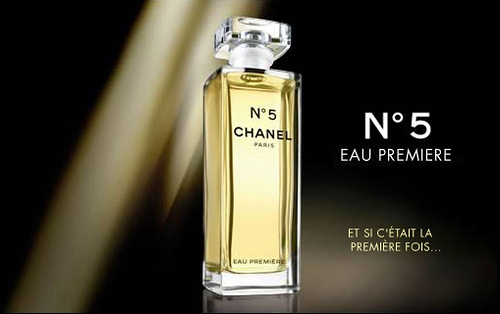 So, I loved that I liked the scent of Chanel No. 5. 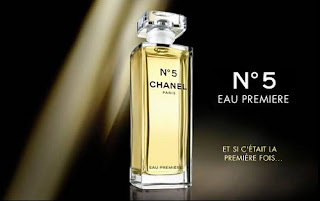 I actually wear the 'Eau Premiere' formula, which is a recombination of different proportions of the same elements producing a lighter version of the original. Even the bottle design seems lighter, more girly than the original. Isn't altering a classic a modern take on it? It's so fresh yet feminine. I wear it everyday. I love the idea of a signature scent. It fits in with my minimalist philosophy rather well, huh? Just one bottle and no urge to own others. But I love it more because it's individualistic, part of your own personal trademark of style. And perfume can be a subtle constant. Wearing a specific article of clothing everyday might be overkill. Furthermore, a signature scent would be style, not a fashion trend. In her book, The One Hundred, Nina Garcia advises readers to stick to a signature scent because she believes scent to be powerful, immediately and vividly taking you back to a memory. "...so when that old lover steps into the elevator and smells your scent, he'll remember the one that got away..." she elaborates. Coco Chanel advises women to wear perfume "wherever one wants to be kissed." It was Ms. Chanel who also said, "A woman who does not wear perfume has no future." This post was actually sparked by another quote of her's. I don't think I knew the saying "A girl should be two things: classy and fabulous" originated with Chanel. I learned that today. This was a woman who was so confident in her style and how she chose to live her life. I hope I'm building and wearing my personal sense of style with confidence.